I will be God to him, and he will be a son to Me.” This word continues the blessings in the foregoing verses, and is spoken in response to New Jerusalem coming down out of the new heaven onto the new earth. We overcome by believing and thus being born of God, receiving His overcoming life. In this life relationship He is God to us and we are His sons. In this life all the sons of God are constituted the corporate expression of God, New Jerusalem. (1 Tim. 3:15-16), is both the house, the dwelling place, of God and the house-hold, the family, all the sons, of God. 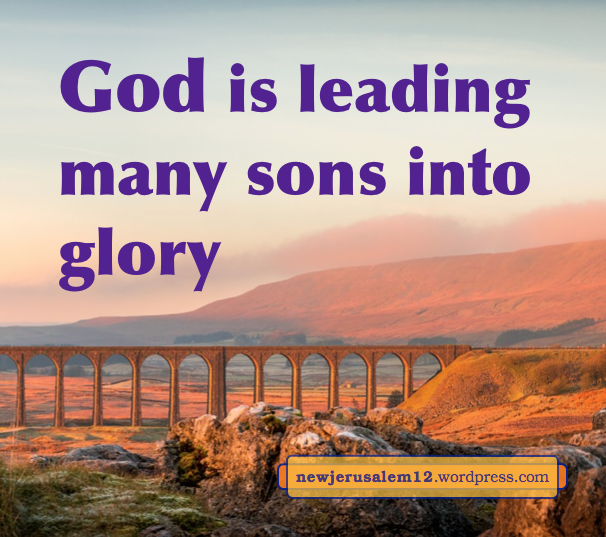 His leading of all His sons is in Hebrews 2:10—God made Christ, the Author of our salvation, perfect through sufferings* and thereby God is “leading many sons into glory,” many sons into the city of glory, New Jerusalem. In contrast to this wonderful destination, Revelation 21:8 speaks of all the evil in the lake of fire, the second death. In Revelation 21:1-8 there are three categories of people: the sons of God constituting New Jerusalem, the nations (including the sheep in Matt. 25) around New Jerusalem, and the evil people in the lake of fire. We who have believed into Jesus Christ are sons of God and will be in New Jerusalem. May many more believe and be led into glory! We were sinners, guilty before God. God’s law said we must die. However, Jesus, the One without sin, died on the cross for us, obtaining forgiveness of sins for everyone who believes. 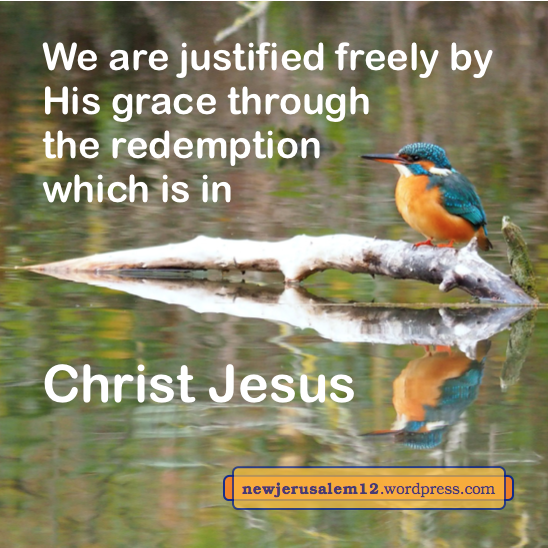 Hence, we are “justified freely by His grace through the redemption which is in Christ Jesus” (Rom. 3:24). This is the first step on our path to New Jerusalem. Few Christians are aware of a further step of redemption (next post), which is also necessary to prepare us for New Jerusalem. A voice from heaven declares, “Let us rejoice and exult, and let us give the glory to Him, for the marriage of the Lamb has come, and His wife has made herself ready” (Rev. 19:7). Then John told us, “I saw the holy city, New Jerusalem, coming down out of heaven from God, prepared as a bride adorned for her husband” (Rev. 21:2). Ephesians speaks about the church, God’s household, God’s kingdom, His temple, the body of Christ, one new man, and marriage. All of these point to New Jerusalem. Since New Jerusalem is a marriage, it is in love. Let us therefore look at love in Ephesians. (1:3-4*). Thus, the love of New Jerusalem originated in eternity past, as part of God’s eternal plan. In this love God predestinated us to be His sons (1:5) so that we may have His life to match His Firstborn Son for the eternal marriage. In time we are touched by and enter into this eternal love. Paul commends the Ephesians, saying he “heard of the faith in the Lord Jesus which is among you and your love to all the saints” (1:15). These believers were already living in the eternal love of New Jerusalem. Seeing the face of God and the Lamb will be an eternal blessing, and a foretaste is available now for those who seek Him. First Corinthians 13:12: “now we see in a mirror obscurely, but at that time face to face.” After the Lord’s visible return to earth, in the kingdom age and in eternity, we will see God’s face clearly. 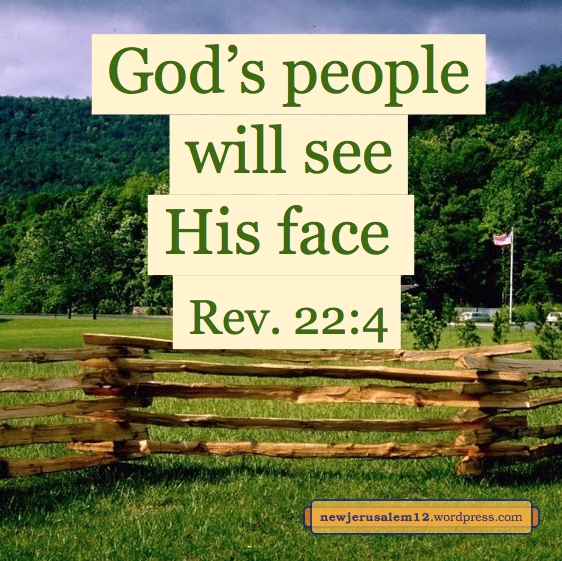 Today we see “obscurely.” Yet, we will look at many verses about seeing the Lord’s face now, a preview of Revelation 22:4’s word about New Jerusalem. “Jesus cried out and said, He who believes into Me does not believe into Me, but into Him who sent Me; and he who beholds Me beholds Him who sent Me.” (John 12:44-45) In this word, beholding the Lord follows believing into Him. In John 14:19 He said, “Yet a little while and the world beholds Me no longer, but you behold Me; because I live, you also shall live.” This beholding is in the realm of resurrection. It is a result of the Lord’s death and resurrection, and by our believing, that we enter this realm, we live (with His eternal life), and we behold the Lord. Beholding the Lord in resurrection is much more than physically seeing the Lord during His time on earth. The same will be true in New Jerusalem, even though we expect also to see Him physically from the time of His second coming. This verse lists eight categories of people and actions which will not be in New Jerusalem. The verse begins but. This indicates a contrast. The prior phrase (21:7) is, “I will be God to him, and he will be a son to Me.” This indicates that the eight categories have not been born of God to be His sons. Revelation 21:27 is similar to 21:8, “anything common and he who makes an abomination and a lie shall by no means enter into it [New Jerusalem].” Verse 27 continues, “only those who are written in the Lamb’s book of life [will enter New Jerusalem].” Like son in 21:7, this word indicates that participation in New Jerusalem is a matter of life. 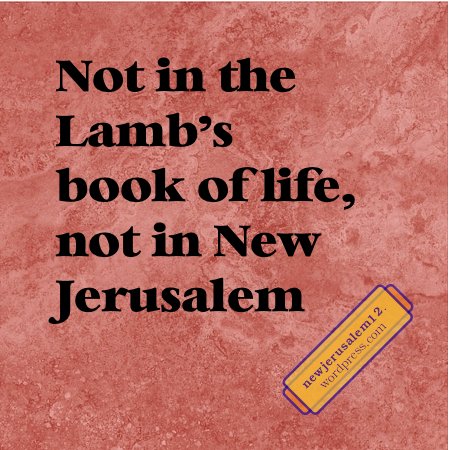 Since the nations around New Jerusalem will bring their glory and honor into New Jerusalem (21:26), they too must be in the Lamb’s book of life. Our goal is not merely to be saved from negative things, but to be built together in the eternal life for God’s dwelling today, which develops unto New Jerusalem. Revelation 21–22 presents a vision of the holy city, New Jerusalem, which comes down out of heaven to the new earth. Let’s look at descriptions of this holy city in other books of the Bible. Hebrews 12:22 speaks of “the city of the living God, the heavenly Jerusalem.” The living God desires a living city composed of all His redeemed and regenerated people. When we are made alive with the divine life in regeneration, we become “sons of the living God” (Rom. 9:26) to be “the temple of the living God“ (2 Cor. 6:6) and “the house of God, the church of the living God“ (1 Tim. 3:15). These consummate in New Jerusalem, the city of the living God. Revelation 21:23 says of New Jerusalem, “the glory of God illumined it, and its lamp is the Lamb.” This combination of city and light reminds me of Matthew 5:14-16. Verse 14 says, “You are the light of the world. It is impossible for a city situated upon a mountain to be hidden.” Although New Jerusalem is not said to be “upon a mountain,” it will be very prominent in the new creation, in no way hidden. Today the kingdom people, with Christ shining within us, are the light to the fallen world. In eternity we, built into the city with Christ continuing to shine within us, will enlighten the new creation. 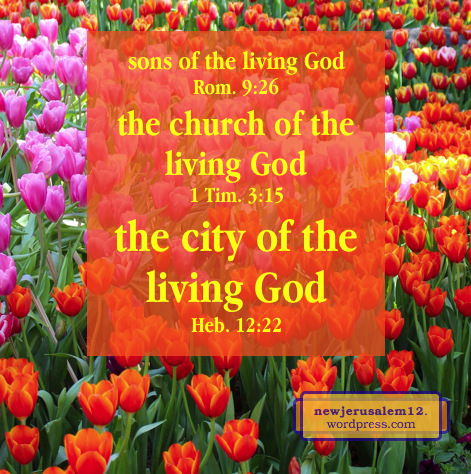 Hebrews 12 presents the city of the living God. Hebrews 11 also speaks about New Jerusalem: “the city which has the foundations, whose Architect and Builder is God” (v. 10) and “He [God] has prepared a city for them [the people of faith]” (v. 16). Here are some prior posts about the God-prepared city in Hebrews 11. 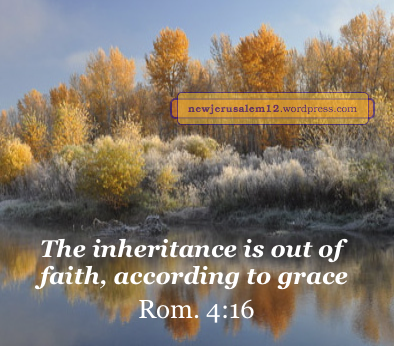 Romans 4:16: “the inheritance is out of faith that it might be according to grace.” We inherit a foretaste in this age, much more in the kingdom age, and the utmost in New Jerusalem. This verse shows that faith and grace are keys to our inheriting. Romans 4 makes much use of the example of Abraham. Hebrews 11 also includes him in the discourse on faith. By faith Abraham “eagerly waited for the city which has the foundations, whose Architect and Builder is God” (v. 10). This clearly points to New Jerusalem, the city which has foundations (Rev. 21:19). 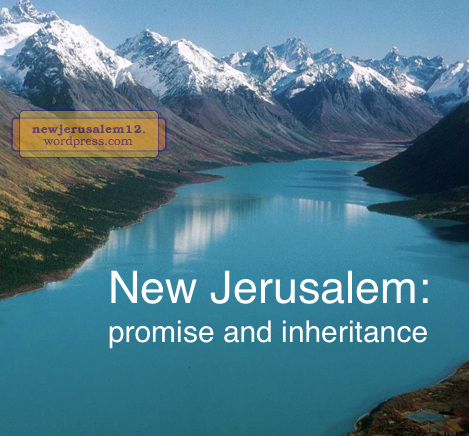 Are we eagerly waiting for New Jerusalem? Or is our eagerness toward a human achievement, a human honor, greater income, a nicer home, or a special vacation? Lord, have mercy on us; align our eagerness with that of the faith people of Hebrews 11. Romans 3:23-24 say, “all have sinned and fall short of the glory of God, being justified freely by His grace through the redemption which is in Christ Jesus.” Because we were sinners, we were separated from glory and couldn’t inherit anything of God, including New Jerusalem, the city full of the glory of God. But by grace we have been justified by the redemption accomplished by Christ Jesus through His death, which qualifies us to inherit. Romans 3 and 4 strongly declare that works, human effort according to the law, is not the way to inherit from God. God’s way is by faith and by grace. Faith and grace carry us to New Jerusalem. Neither faith nor grace originate with us. Peter says that God has allotted faith to us (2 Peter 1:1). Paul says the grace of God was given to us (1 Cor. 1:4). God’s eternal plan, expressed in His creation (Gen. 1:26), is to have a corporate man to express Him. For this, God wants us to be part of New Jerusalem, and to make this possible He has provided faith and grace. Thank Him! Photo courtesy of US Forest Service. Ephesians 1:3-14 presents God’s spiritual blessings to us in Christ. Three times we are told that these blessings are to the praise of His glory. This goal links Ephesians 1 with New Jerusalem, the city of glory. We heard the word of the truth, the gospel of our salvation. We heard because God is “the One who works all things according to the counsel of His will” (Eph. 1:11). Our hearing generated faith within us (Rom. 10:17). This faith brought us salvation. This salvation includes the sealing of the Holy Spirit. The seal indicates that we belong to God. It is like a name tag on an object, except that it is living and inward. We belong to God for His purpose which ultimately is New Jerusalem. We are sealed with “the Holy Spirit of the promise.” This promise includes all of God’s blessings in Christ. The concluding portions are “the promise of the eternal inheritance” (Heb. 9:15) and “new heavens and a new earth” (2 Peter 3:13) both of which point to New Jerusalem. The Holy Spirit of the promise is also “the pledge of our inheritance” (Eph. 1:14). First Peter 1:4 tells us that this inheritance is “incorruptible and undefiled and unfading, kept in the heavens for you.” Like the promise in verse 13, the inheritance in verse 14 (✺ ✺ ✺) points to New Jerusalem. New Jerusalem is the consummation of every positive quality in the Bible. 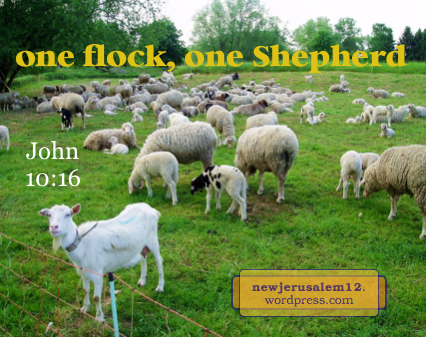 Jesus told us, “there shall be one flock, one Shepherd” (John 10:16). This is the first definite word in the New Testament about our spiritual oneness. This oneness develops through the one Body, the one new man (upcoming posts), to the one New Jerusalem. In John 9 the Lord gave sight to a man blind from birth. This man, viewed as a disciple of Jesus (John 9:28), was cast out of the Jewish fellowship in the synagogue (John 9:22, 34, 35). From the religious Jews’ viewpoint, he was cast out. However, from Jesus’ viewpoint, he was a sheep and Jesus led him out of the sheepfold to find pasture that he might have eternal life (John 10:9-10). The Lord also says He laid down His soul life, His human life, to accomplish redemption for His sheep (vv. 15, 17-18) that they may share His zoe life, His divine life (v. 10b), the eternal life (v. 28), by which they can be formed into one flock under Himself as the one Shepherd. * This eternal life makes us one and brings us all the way to New Jerusalem. * An extract from the note on John 10:11 in The Holy Bible, Recovery Version, www.recoveryversion.org, published and © 2003 by Living Stream Ministry. New Jerusalem is composed the Triune God and the people who are one with God, who have God in Christ as their life and everything. Other peoples, the nations, live around New Jerusalem (Rev. 21:3, 24-26). Revelation 21:3 has the declaration, “Behold, the tabernacle of God is with men, and He will tabernacle with them, and they will be His peoples, and God Himself will be with them and be their God.” This is a wonderful verse, but it also highlights a difference between the people constituted into New Jerusalem and the peoples living around it. The difference is “God.” God is both the God of people built into New Jerusalem and the God of the peoples around the city. In contrast, God is the Father of those in New Jerusalem but not the Father of those around it. Jesus, speaking about resurrection, also said, “If anyone loves Me, he will keep My word, and My Father will love him, and We will come to him and make an abode with him” (John 14:23). And, “because you are sons, God has sent forth the Spirit of His Son into our hearts, crying, Abba, Father!” (Gal. 4:6). Jesus said to him, I am the way and the reality and the life; no one comes to the Father except through Me. 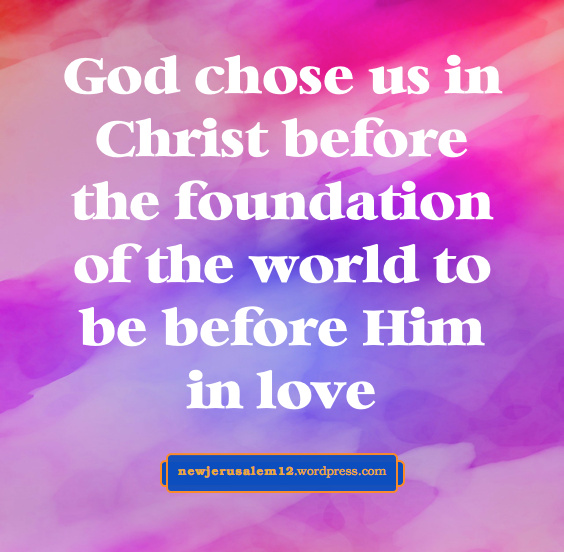 Also, the second verse of Ephesians, Philippians, Colossians, and 2 Thessalonians speak of “our Father.” God is our Father and His divine and eternal life, the life of New Jerusalem, is our life. By and in this life we are part of, rather than around New Jerusalem. God’s created man in His image because of His desire to have a corporate expression of Himself by means of God becoming man’s life. This expression culminates in New Jerusalem. To express God, to fulfill what New Jerusalem will be, we need God’s life and nature. This need is illustrated with a monkey, which can be trained to briefly imitate a man, but can never fully express a man because it does not have the man’s life and nature. By faith we are born of God (John 1:12-13, 3:5-6) and we have God’s life, the life flowing as a river in New Jerusalem. But don’t wait until then—Christ is our life now (Col. 3:4). By this same faith, we participate in “all things which relate to life and godliness” and receive “precious and exceedingly great promises” so that we “might become partakers of the divine nature” (2 Peter 1:3-4). This divine nature is symbolized by the gold of New Jerusalem (Rev. 21:18, 21). As this divine life and nature spread in us, God’s expression develops in our being and in our living. This development continues through our entire life and culminates in New Jerusalem. 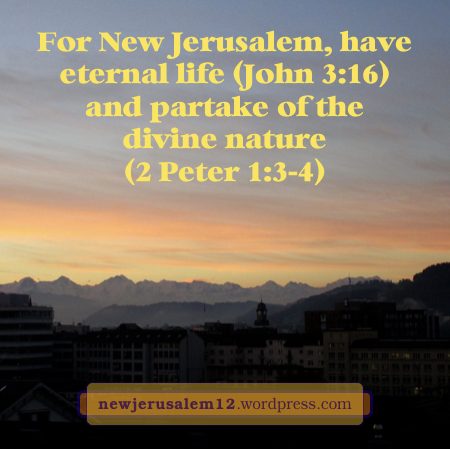 Related Post: God’s Life and Nature for New Jerusalem. * Affirmation & Critique (A&C) is a Christian Journal published twice a year, © Living Stream Ministry. A&C presents Bible truths in a scholarly manner, with references to and citations from a variety of publications by authors over the entire Christian era. A&C exhibits much appreciation for the person and work of Jesus Christ and our life with Him. This group of my posts has short extracts from the article The New Jerusalem—the Consummation of the Divine Economy according to the High Peak of the Divine Revelation by Ron Kangas in the Fall 2010 issue. Genesis 1:27 says, “God created man in His own image; in the image of God He created him.” God’s goal in creation, ultimately realized by New Jerusalem, was that man would receive God as life and be enabled to express God. The created man sinned and was shut out from the tree of life. But the redemption of Jesus Christ opened the door for man to receive God in Christ as life. By receiving, we are born of God and become God’s sons. “As many as received Him, to them He gave the authority to become children of God, to those who believe into His name, who were begotten…of God” (John 1:12-13). The goal of God creating man in His image is fulfilled in New Jerusalem which has, and radiates, the glory of God. 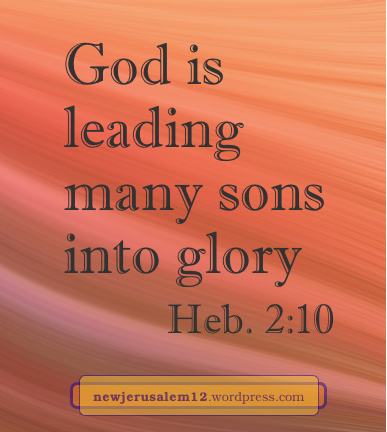 To achieve this goal, God is now “leading many sons into glory” (Heb. 2:10). Father God, thank You that I am one of Your sons. Lead me every day further into glory, all the way to New Jerusalem. * Affirmation & Critique (A&C) is a Christian Journal published twice a year, © Living Stream Ministry. A&C presents Bible truths in a scholarly manner, with references to and citations from a variety of publications over the entire Christian era. A&C exhibits much appreciation for the person and work of Jesus Christ and our life with Him. This group of my posts has short extracts from the article The New Jerusalem—the Consummation of the Divine Economy according to the High Peak of the Divine Revelation by Ron Kangas in the Fall 2010 issue.